The demolition of a historic building on 439 Powell Street that was initially scheduled for Monday morning has been put on hold until at least tomorrow. The owner of the building, the Ming Sun Society, has been requested by the City to repair one wall and a chimney. However, the the threat of the demolition is far from resolved and the future of the building remains indeterminate. The latest notice by the City also raises question around why the building was condemned in the first place if only these minor repairs were required. This is the second “emergency” demolition within the last 5 months on the 400 block Powell street. The first impromptu demolition was the Philippine Women Centre on 451 Powell, destroyed in July of this year. While the scheduled eviction of 439 Powell Street has made headlines, few have linked it to the wider changes in the neighborhood. In March 2013, City Council approved a 24 unit condominium development across Oppenheimer Park, planned by Boffo Developments at 537 E Cordova. Another condo development is proposed at 626 Alexander Street. Retail gentrification has also moved rapidly along East Powell Street, with businesses like Cuchillo, Big Lou’s Butcher Shop, Fat Dragon and soon to open Guerrilla Foods. These changes give the main property owner on the block of 400 Powell – Tom Chow – a strong incentive to see the buildings vacated and demolished to capitalize on rising property values. 439 Powell Street is run by the Ming Sun Benevolent Association and contains eight SRO units, two artist studio spaces, and is home to many important historical artifacts, photos, and documents as part of the Ming Sun Reading Room. The building housed 10 low-income seniors and the Instant Coffee art collective, all of which were hastily evicted after the city deemed the adjacent building, 451 Powell, to be unsafe. Within a week, on July 24th, the tenants of 439 Powell were evicted and the Philippine Women Centre at 451 Powell was torn down. The lots on both sides of the Ming Sun Society are now owned by Mr. Chow. The Philippine Women Centre was demolished before legally becoming Mr.Chow’s property, leaving the Centre to pay the financial bill. The Philippine Women Centre has since been sued for damages to 439 Powell, even though the damage was caused by the city’s demolition crew. Chow now owns the site at 451, which means that if 439 Powell is demolished he will have a blank slate to develop the three conjoined properties in the rapidly gentrifying Downtown Eastside neighborhood. After the demolition of the Philippine Women Centre the tenants of 439 Powell were unable to return to their homes. With the building left in a vulnerable position, further damage occurred, including theft and vandalism. In an interview with the CBC, David Wong of the Ming Sun Society speculates that the extensive damage incurred by the vandalism made it seem like there was “a calculated desire to damage and inflict as much damage as possible.” The Ming Sun Benevolent Society built a fence, installed a security system, and seniors were on watch duty in the evenings. They paid about $18,000 in security bills but have since run out of funding. They asked the City for help but received unfulfilled promises. Bing Wong, one of the long-term tenants who is a trained engineer, had been taking ongoing care of the structure including a roof replacement and room-by-room maintenance. Members of the association were frustrated by the City’s decision to demolish, even after the building passed inspections by structural engineers from the City and by independent inspectors hired by the Ming Sun Benevolent Association. 3. Cover the costs to repair the structural damage the City had caused during the demolition of 451 Powell Street. David Wong states, “we want the city to apologize for how they treat low-income seniors and how they force them out of their homes.” He is asking for the City to work with the Ming Sun Benevolent Society in a transparent manner. Wong is also demanding a written apology and for restitution to the Ming Sun Benevolent Association for the damage caused by the city’s demolition effort next door. Lastly, he is demanding the further protection and security of the building. 439 Powell Street has deep historical significance. It belongs to the Ming Sun Benevolent Association, who is one of the first Chinese-Canadian organizations to be formed as a non-profit society in 1925 to address the issues of the Chinese Head Tax and the Chinese Exclusion Act of 1923. 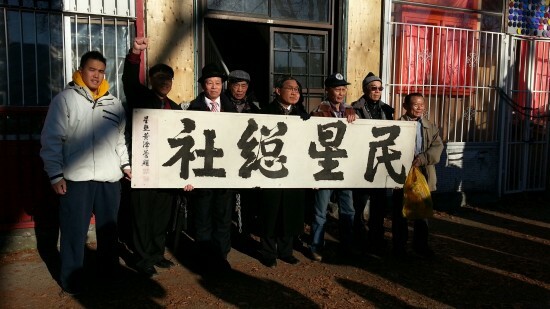 A group of friends of the Wong Clan from Hoi Ping, Southern China, pooled their resources to purchase the building, which provided housing, gathering space, news and information, and necessary social services for single Chinese men. Mayor Gregor Robertson proclaimed Ming Sun Benevolent Association Day on April 24th, 2010 to honour the contributions of the association. A copy of the proclamation was shredded by David Wong at the press conference last Friday. The displacement of ethnic senior tenants at 439 Powell is not an isolated case. This month 80 Chinatown seniors are fighting a massive rent increase at the Chau Luen towers, just down the street from 439 Powell. Like 439 Powell, the Chau Luen towers are also surrounded by new market condo projects approved in the past year by city council, along Main and Keefer streets. The eviction at Ming Sun is part of larger issues of displacement and systemic racism inherent to the gentrification process in the Downtown Eastside. The continued displacement of indigenous people, chinese seniors, minority groups and low-income people shows that the initial displacement violence that shaped the Downtown Eastside is today ongoing. Eiko’s message is important in the context of persistent systemic racism and language difficulties faced by Chinese seniors in the Downtown Eastside. These barriers are becoming more and more severe as culturally appropriate services and housing options available for chinese seniors are being pushed out by gentrification. The scale of the problem is significant: according to the 2006 census, there are 3,740 seniors over the age of 65 living in the DTES and approximately 1,739 of these seniors depend on non-market housing. Yet the number of non-market housing available for Chinese Seniors in the Downtown Eastside is diminishing, under threat from gentrification and rising rents. The story of 439 Powell is further evidence that nothing is being done to secure the existing housing stock in Chinatown. The situation facing these seniors was recently discussed in an illuminating series of articles by Jackie Wong. A full 88% of these seniors identify Cantonese as their primary spoken language, and the top three service gaps identified were language barriers and the need for translation services; racism and discrimination; and a lack of information, education, and advocacy. The growing waiting list for senior social housing is over 4,549 names long, but there is currently little capacity to house them – let alone provide culturally appropriate support services. 439 Powell Street was one of the few remaining affordable and culturally appropriate housing options for Chinese Seniors in the neighborhood – and that is why it’s so important to fight to save it. Sign the petition to Vancouver City Council. Jennifer Clarke, defeated mayoralty candidate once vowed to “reclaim the Downtown eastside block by city block”. Today that ‘vision’ is implemented by Vision Vancouver at the expense of the poor and marginalized. Thank you for an enlightening article. 40 years ago, Chinatown and Strathcona faced the threat of demolition in order to build a freeway. They organized and others joined them and stopped it, and threw out the then-NPA dominated Council in the process. This onslaught of demolitions is a freeway for developers & the politicians they support. It has to be stopped and it can be stopped. There is a precedent. Nice new condos for yuppies! Great going, Gregor! Fat Dragon is not part of the gentrification because it already folded. Regarding the “emergency” demolition, what is your source for the astounding allegation that the city demolition crew was responsible for the damage to the Benevolent Association/Instant Coffee building? Ted Alcuitas – if you’re still following – your story in the Philippine Asian News Today indicates that the collapse of the neighbouring building, 451 Powell was not exactly unexpected. It had a great many problems that have been known about since at least 1996 when it was bought. That seems to be why Ming Sun is suing the Philippine Women Centre and not the city. Did you have evidence that Ming Sun was hurt by the city’s own actions? If not why not report it? It’s one thing to have a general suspicion of Vision because they are in power, and people in power are almost invariably dicks. Criticism, holding feet to the fire, demanding evidence to verify claims – excellent. I’m also onboard with your linking the demolition of 439 Powell to a pattern of what some call much needed revitalization and others call grotesque displacement and money grubbing. That’s the city’s call to make and if you don’t like it, you can inveigle against it as you have done so well. This article suggests that the only thing wrong with 439 Powell is a few minor repairs. You’re implying that it’s basically a safe building. Also, that the damages were done by the city. What’s your evidence? If you’ve got evidence, this is a very serious scandal, it might show malfeasance. If not, it looks like going off half-cocked.